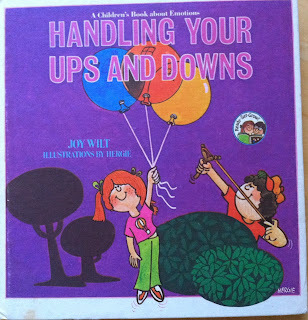 A Facebook friend of a friend suggested Handling Your Ups and Downs by Joy Wilt Berry for helping teach kids the appropriate responses to various situations and the emotions they evoke. I liked the sound of the title, and the Rainbow Brite illustrations kind of brought back some fond 80s memories of my childhood. The book, which is out of print but easily available through Amazon third party sellers, is deceptively long at 127 pages. The book is broken into three chapters: Feeling Up, Feeling Down and Handling Your Downs. The final chapter is the longest and is comprised of various conflicts and how a child might handle them in both inappropriate and productive ways. This is not an overtly Christian book, though I'd wager the author is a Christian for tackling so many children's books on character building. Wilt's approach to feelings is that it's perfectly natural and normal to have both good and bad feelings. Even a bad feeling, Wilt says often in the book, "sometimes makes a person do what needs to be done." This laid-back approach frames bad feelings, such as guilt, rejection or loneliness, as clues or signals that something can be done to help remedy the uncomfortable situation. My five-year-old, Stephen, enjoyed this book, often requesting that we read more than one scenario each night. He was often able to relate to the situations in the book and share some of his own emotional struggles. In particular, I found the section on guilt (pp 44-49) to be a great springboard for discussion, as Joe and I have been working with Stephen on how to deal with guilt. Wilt's suggestion for handling guilt is concise and covers all the bases: "Admitting that you did something wrong, saying you're sorry, and (whenever possible) trying to make up for what you ave done are all good things to do when you feel guilty." While this book might still be a little beyond Stephen's maturity level, I'm really glad to have found it. I plan to make it part of a regular cycle of devotional bedtime reading and will probably explore more of Joy Wilt's other books.